William Christenberry, born in Alabama in 1936, is an artist who works in several different media…sculpture, painting, photography. Like so many Southern artists of his generation, Christenberry left the South as soon as he could. He moved to New York City and began painting large abstract-expressionist canvasses. But like so many Southerners, he eventually found himself drawn back to his native roots. Over time his work began to be more regionally focused. Now his main subject is the American South and the effects of the passage of time on the region’s culture and landscape. Most of his work has centered around the transformation of Hale County, Alabama…Christenberry’s childhood home. In 1961 Christenberry returned to Alabama, taking along a simple Brownie camera. He took simple snapshots of the places he remembered. He returned the next year and photographed the same places. And he did the same the next year. 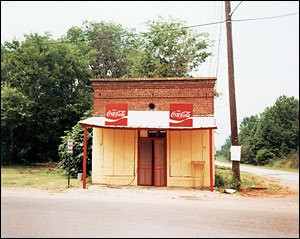 And every year since 1961 Christenberry has returned to Hale County, Alabama and photographed the same places. "I’d go into that landscape." Christenberry has said, "and make these snapshots. Never did I dream that years later, the world of fine-art photography would see something in these." Over time his equipment improved (he now works with a Deardorff 8×10 view camera in conjunction with his old Brownie), but the photographs in this series remain simple and unsophisticated. The photographs here show the evolution…and devolution…of a single building. 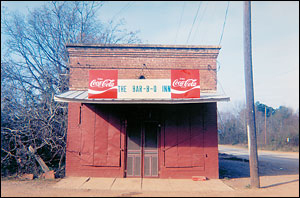 It began as a radio repair shop, then became a "colored" juke joint that sold barbecue to legitimize the sale of alcohol and the live music. Later, as the South began to desegregate, it became better known for its food than for its music. A kitchen fire closed its doors for good, and eventually it was torn down. 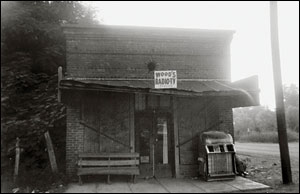 Christenberry’s photographs document the changes of dozens of such locations. Old churches, weird little buildings on the edges of town, tar paper shacks. It is, in a way, the very artlessness of the photographs that give them power and authority. Christenberry has shown he can create more artistic photographs, yet he chooses to deliberately keep these photos simple and snapshotish. "What I really feel very strongly about, and I hope reflects in all aspects of my work, is the human touch," Christenberry says, "the humanness of things, the positive and sometimes the negative and sometimes the sad."